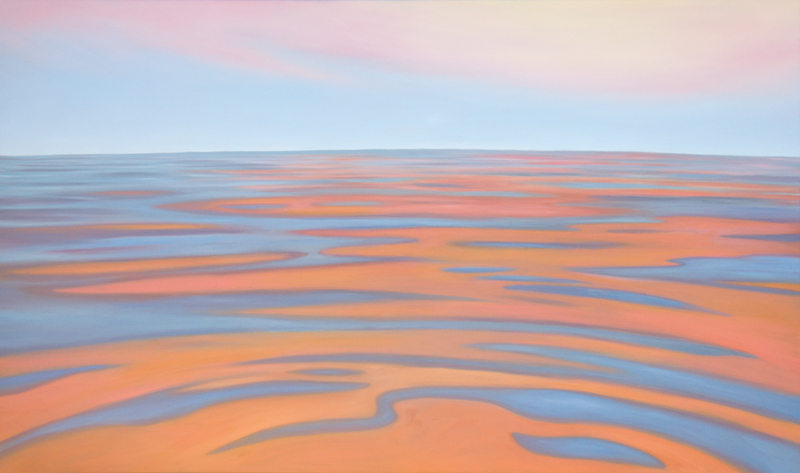 The vibrancy of a morning sunrise reflecting off calm water, is used in this painting as a metaphor for a still mind. It has been said that “Still waters run deep” and I will agree. In learning to quiet the restless mind, we can access an unlimited supply of grace. With grace, I believe, comes the depth of wisdom. The bright color of the reflected sky, symbolizes the bright light each of us can be when we quiet our minds enough to consciously appreciate the blessings in our lives, the goodness inherent in others and the healing which takes place when we do. So many people seem content to “swim on the surface of life” as Ruzica, my yoga and spiritual teacher of 30 years would say. Materialism and travel, addictions and the thoughtless pursuit of pleasure are all excellent distractions from the healing and inner peace which comes from facing oneself and doing the inner work necessary to mend a broken heart. There are those of us who want to dive deep below the surface of life and oh what treasures we have found there! “You’re too deep,” I have been told. So be it. I am an introspective artist and with this comes a desire to create art which expresses my inner life. The challenge is to be as the surface of still water is at all times, reflecting the Divine, no matter what may befall me.